In 1962, President Kennedy proclaimed May 15 as National Peace Officers Memorial Day. National Police Week, established by a joint resolution of Congress, is set aside to recognize the every-day sacrifices police officers make. National Police Week is May 14 – May 20. In preparation for National Police Week, police officers from across Williamson County and police supporters will gather at 6:00 pm on May 9 to honor those who lost their lives while protecting and serving the Williamson County community. 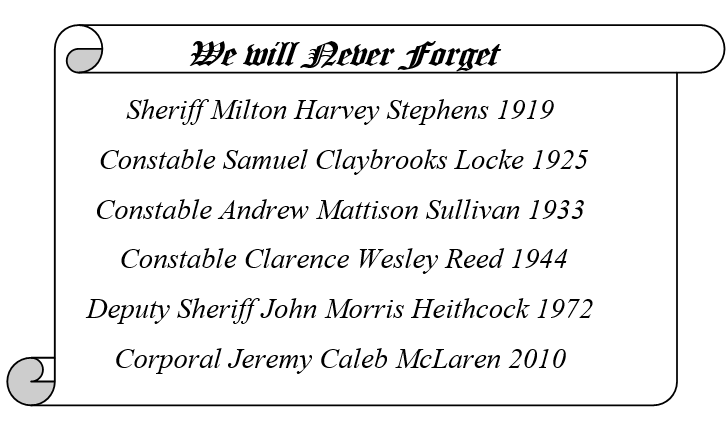 Six greater Williamson County law enforcement officers have been killed in the line of duty: Tuesday’s Fraternal Order of Police memorial will honor each of them, as well as the 143 U.S. police officers killed in the line of duty in 2016, and the 40 who have died while protecting our communities, so far this year. The May 9 service will begin at 6:00 pm at the Franklin Theatre, 419 Main Street; The Honorable Alberto Gonzales, the 80th Attorney General of the United States, is the keynote speaker. A foot procession and concluding ceremony will follow at the Police Memorial Monument on the Square with a 21-Gun Salute and Taps. The public is encouraged to attend.